Take Action Or Get Out Of The Way! First Impressions - Are they attracting your ideal clients, or are they pushing them away? Recently I was reading a survey on the State Of The Mobile Experience. It was about phone calls. It stated that 74% of callers were more likely to take their business elsewhere after a bad phone experience. Of those people, 38% were like to leave a bad review online. 80% of callers, in general, were likely to become repeat customers after a good phone experience. It started me thinking about that first impression, and how important these first impression truly are, so when you answer your phone, and you're talking to a prospect or a client, how do you sound? Do you sound excited and interested in what that person has to say, or do you sound bored and uninterested? Are you knowledgable about your products and services? Do you know your script inside and out, so that you can communicate your thoughts and ideas effectively and clearly, or do you leave it all to chance? That first impression can mean the difference between success and failure. How about other first impressions? How do you dress? How do you carry yourself? How do you speak? What does your website look like? What do you post on social media? Are those first impressions attracting your ideal clients, or are they pushing them away? Is it making them feel confident about doing business with you, or is it making them question whether or not you would be a good fit for them? About four years ago there was a dry cleaner that opened up around the corner from me. I went into the dry cleaner, and I met the owner. The first impression I got from the owner was that he was a jerk. I didn't like him. It was a very bad first impression. I decided to take my business elsewhere. I now go to a dry cleaner that is about a mile away from me. The first time I walked into that dry cleaner, the owner greeted me with a smile, and she looked genuinely happy about having a new customer. I've now been going to that dry cleaner for four years. This is four years of business that first dry cleaner could've had if they had given a good first impression. It tells you a lot about how valuable that first impression can be. What about your first impressions? Are you attracting your ideal clients, or are you pushing them away? We've all heard the story of Paul Revere and his Midnight Ride. It's been taught in all of our history books. Paul Revere set out on horseback to alert the American militia that the British were coming. yet that story is highly inaccurate. Our history books don't talk about the other people who rode along with Paul Revere. They don't talk about William Dawes or Samuel Prescott. William Dawes actually travelled further than Paul Revere, and Samuel Prescott was the only one to reach his destination to warn the militia that the British were coming. Paul Revere never made it to his destination, instead he was arrested by the British. Yet we never hear about that. We just hear about The Midnight Ride of Paul Revere. Why is that? Because it's a story that inspires. It's a hero's story. Its a story that people want to hear. What does this have to do with you and me? I recently read an article from Jason Feifer, the editor of Entrepreneur magazine. He talked about the time when he was a guest on an online talk show. Afterward a lady stood up and said that she had encountered countless setbacks and many obstacles in her career, she felt like she was stagnating, and she didn't know how to push forward. Jason responded, "Nobody sees your past except you." Every single day we see stories being told on social media. Some people only talk about the positive things in their lives, and others share every flaw and every setback they encounter. If you want to be successful in life, and if you want to be successful in your career, share your stories in a way that instills confidence and inspires the people around you. Throughout my career I've had plenty of setbacks, but most people don't hear about that. All they see is the successful corporate entertainer who gets to travel the world doing something he loves to do. Very few people know about the ten years I spent as a professional musician playing in night clubs, struggling to make ends meet, not having any money, and at the end of those ten years not having anything to show for it, and then being suicidal at the end of it all. Most people don't hear that story. They don't hear about the trials, challenges, and sacrifices I've had to make to get to the point where I am today where I get to enjoy the success I've achieved. You don't hear about those struggles. You only hear the stories that I want you to hear. Even right now, you're only hearing the story I want to tell. So how do you want your story to be told? Share the stories that are going to instill confidence and inspire others. Be an attractive person, and you don't do that by talking about all the bad things that have happened to you in your life. You can talk about those things just like I did a moment ago, but you don't want that to be the focus of what you talk about. You don't want people thinking they don't want to associate with you, because all you talk about is the negativity that is going on in the world. Instead be a beacon of light that shows the positivity that emanates from you. Instill confidence and inspire others, and you will see that your success will grow. Tell your story in a way that you want it to be told. 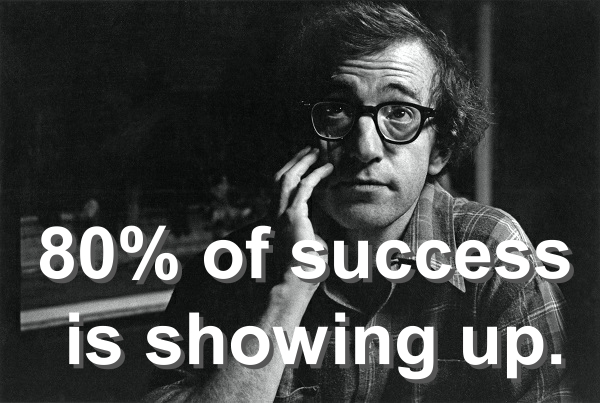 Woody Allen is famously quoted as saying, "80% of success is showing up." What does that mean? If you want to get in good physical shape, and you show up at the gym, you are 80% there, because you'll probably work out. If you want to be a screenplay writer, you have to show up by putting words on a page. If you want to be a keynote speaker, you have to show up and speak in front of an audience, but first you must declare! You must declare who you want to be, and then show up as that person. Back in January of 2013 I wrote a blog post To Be... You Must Do. It goes into more detail about this subject. Who do you want to be? Declare you are that person, show up as that person, and be that person. The video above goes into much more detail and the concept is a main contributor to my success. 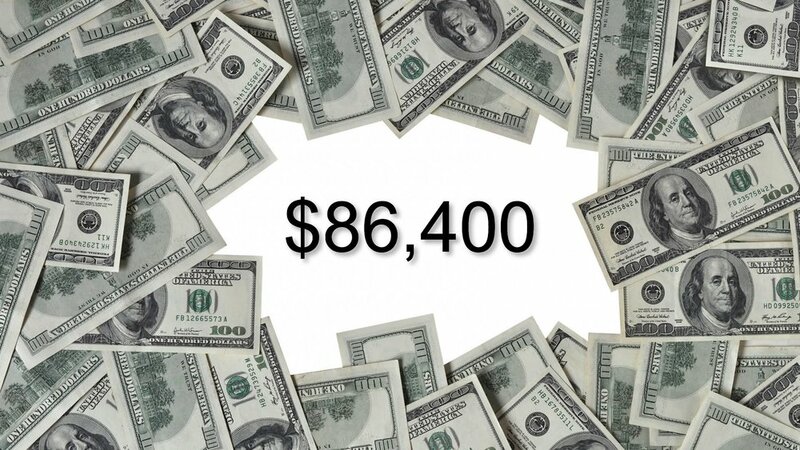 What Would You Do If You Won $86,400? Imagine you just won a prize, and every single day your bank deposits exactly $86,400 into your bank account for you to spend however you wish. But there are two stipulations. First, you have to spend all the money by the end of the day, or you lose it. You can't transfer it to another account. You can't save it for a rainy day. You either spend the money or you lose it. The second stipulation is that the bank can decide to stop making those deposits anytime it chooses. Until that time comes, the bank will continue to deposit exactly $86,400. What would you do with the money? The truth is we already have an account that is similar, because every single day we all have exactly 86,400 seconds to our day, and if we choose to not spend that time wisely, we can't roll over that time to the next day, and we can't transfer it to another account. We either use it or lose it. We often think that if we just had a few more hours we could accomplish more in our day. yet there other people who accomplish ten times as much as we do in the exact same amount of time. So what is stopping us? How will you use your time? Will you let that time waste away, or will we use it to accomplish your goals and live your dreams? The author of the following story is unknown, but it delivers a powerful message. 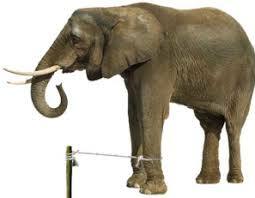 The story of an elephant tied to a rope is a great metaphor for things that are holding us back from achieving the success we desire in our lives. In this video I share with you how to identify the breakdowns in your business systems, and how to fix them to create the success you desire. I've been studying marketing and business development for over 25 years; longer than I've been studying and performing magic. Throughout the years I've had mentors and coaches, I've enrolled in coaching and business development programs, and I've coached others on their journey to become incredibly successful entertainers. Some of these people have gone on to produce six-figure yearly incomes. In my own journey to success I often say that I don't know what I don't know. There are strategies and tools that others use to create success and wealth that I don't know about, and in seeking out coaching from others I'm able to fill in the gaps. I learn and emulate the actions of others who are much more successful than me, and in doing so it helps me to create unprecedented success in my own business and life. I just finished Barry Friedman's Showbiz Blueprint. It's an intensive 10-week business development program. I learned a few things that I didn't know about, and in implementing these new strategies I was able to book enough business to pay for the program and make a profit on top of it. I believe these strategies will continue to produce results for many years to come. In a few weeks I'll be flying to Vancouver, BC to attend Randy Charach's Show Business Bootcamp. This will be a highly focused and intensive two days in his private home, and will only be available to a maximum of nine attendees. I've been following Randy for well over a decade. Back in 2004 I purchased his Secrets Of A Millionaire Magician in which he shared a plethora of real-world knowledge about the entertainment business. Randy is a highly successful entertainer and businessman who has achieved success beyond what most entertainers can ever hope for, and for a few days in August, I will have the opportunity to sit by this man and learn the secrets of his success. On August 19, 20, & 21, 2016 he will open his home to nine lucky people. I was the first person to sign up to the program, and Randy has allowed me to offer a discount to all of you. Visit www.Charach.com, watch the video (which is incredibly inspiring), and if you decide you'd like to join me in August, enter coupon code, LOU, and receive a $500 discount on the price of the program. Even coaches need a coach, and I'm excited for the opportunity to learn from and emulate the strategies of an incredibly successful entertainer. I hope to see some of you there! About a month ago I was hired to perform at a convention in Las Vegas. Christie Brinkley was in attendance to promote one of her products, and I had the opportunity to perform some magic for her, and in the process I picked up a really powerful marketing lesson. The implementation of this one idea can have an immensely positive effect on both your business and life. Check out the video, and leave a comment below. I'd love to hear your thoughts!